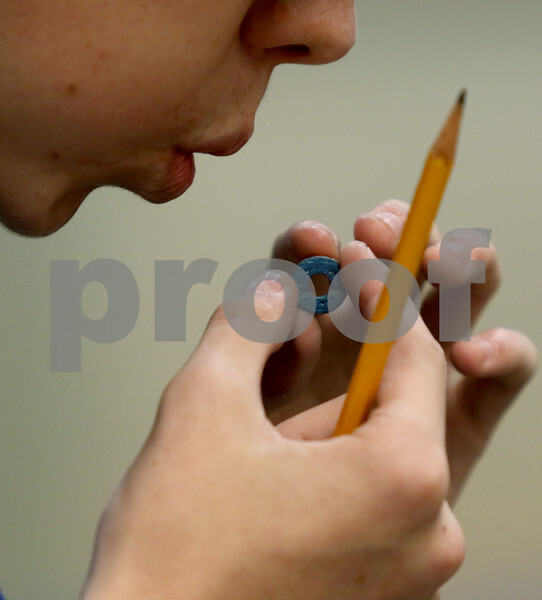 Hampshire High School sophomore Ryan Hopfner, 15, blows on the nail polish he used on a circular piece of skateboard that he is turning into a necklace charm for his girlfriend on Thursday, Oct. 12, 2017 at Fargo Skateboarding in DeKalb. "She always steals my dogtag, so this is something she can take," Hopfner said. Students from District 300, including Jacobs, Hampshire, and Dundee-Crown High Schools, were able to take a trip to DeKalb to learn the repurposing craft from Fargo owner Ariel Ries due to an annual D-300 Foundation grant.